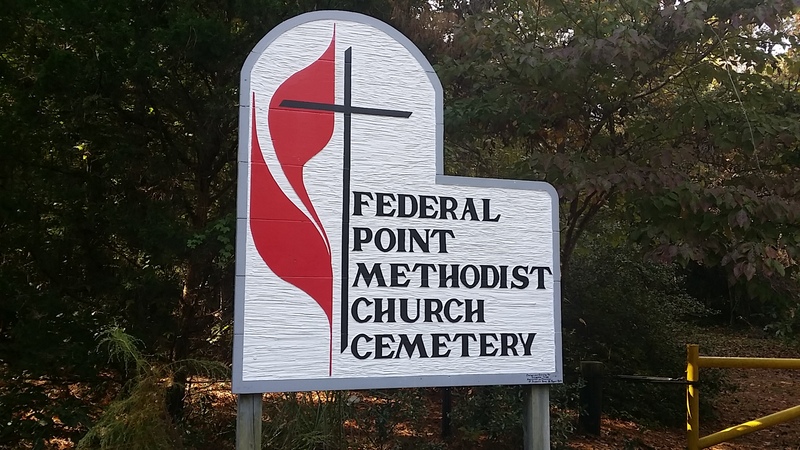 The Federal Point Historic Preservation Society will hold its monthly meeting on Monday, April 16, 7:30 pm at the Federal Point History Center, 1121-A North Lake Park Blvd., adjacent to Carolina Beach Town Hall. 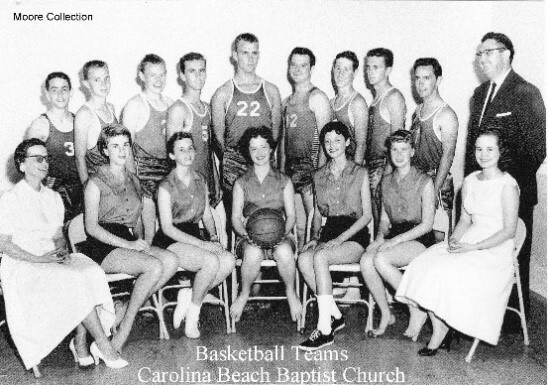 Lynn Welborn’s program will focus on the organized sports that were offered on the island prior to 1980, little league baseball (one team), youth soccer (two teams) and church league basketball (various number of teams depending on the year). A discussion of other sports prior to organized sports will also be included. 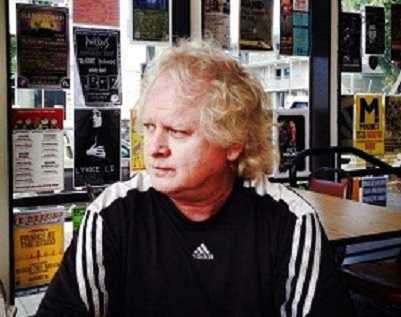 Dr. Lynn R. Welborn is an award-winning journalist and professor who recently published his debut novel, Crazy Beach, about growing up on the island in the 60s and 70s. Dr. Welborn was raised on the island, attended Carolina Beach Elementary School, Sunset Junior High, Williston 9th Grade Center and graduated from Hoggard. He played multiple sports both on the island and for local schools. Welborn went to work in the newspaper business, getting his start at the Island Gazette the paper’s first year. His career path led him to several major newspapers, radio stations, and after earning his Doctorate degree, a career as a professor. Currently, Dr. Lynn R. Welborn (DM, MBA) is the owner of – QLC- Quantum Leap Consulting. 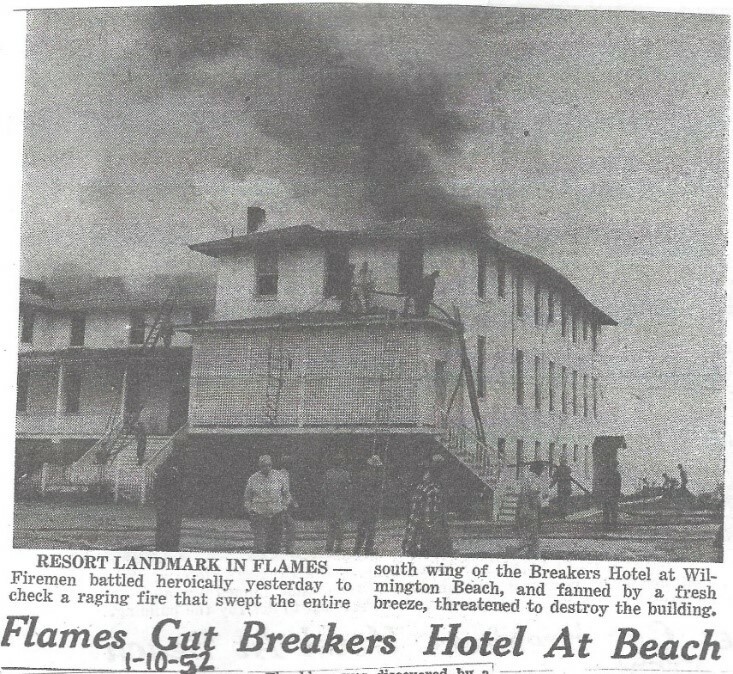 In this Breakers Hotel ad from the Sunday Star News, June 13, 1948 edition, one can see that the building has been stuccoed and painted white giving it a whole new look. 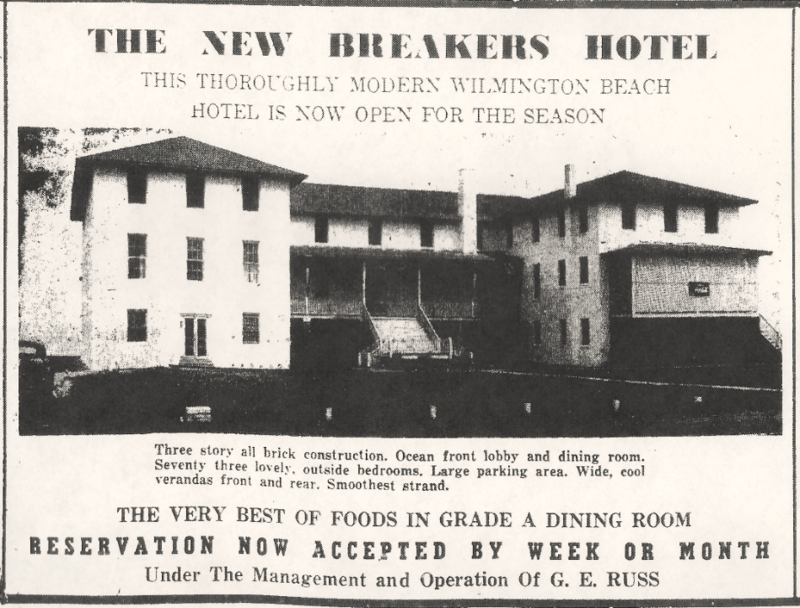 The ad’s photo shows the side of the Breakers that faced the street. 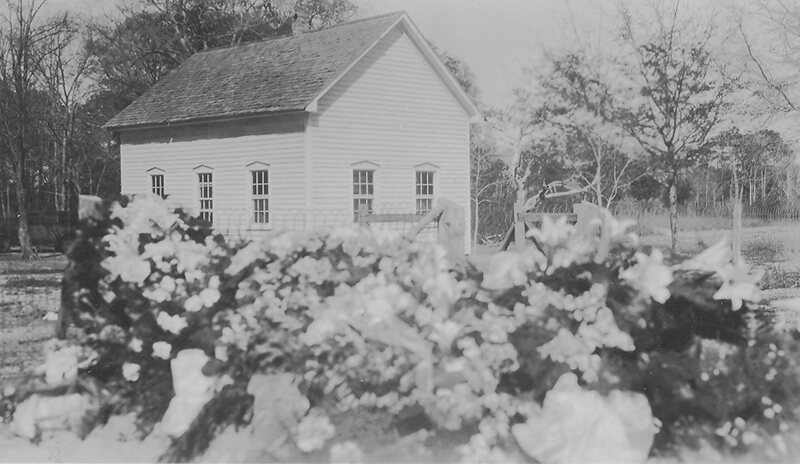 It also shows a north wing and south wing with a recessed porch in between. The lobby and dining room faced the ocean on the other side along with the long porch running the building’s length. The original 50 bedrooms have been converted to 73 and the manager that year was George Earl Russ. In late 1951, the Breakers was purchased by Earl Russ and John Crews. They spent $5,000 in repairs and new furnishings before a fire broke out in the southern wing apartment on January 10, 1952. The fire mainly affected the southern wing with the main part and northern wing unscathed. Two years after the fire, Russ and Crews sold the hotel to Lawrence C. Kure and Glenn Tucker. They had bought the Wilmington Beach Corporation which included the remaining unsold land. 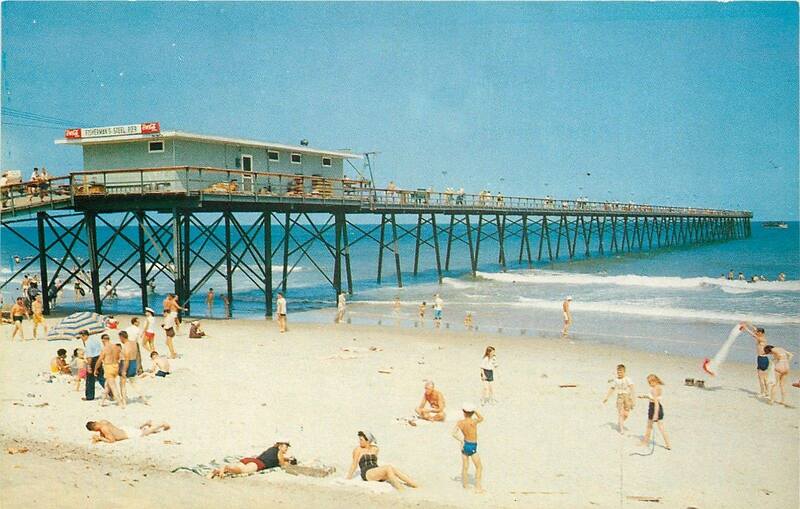 Tucker planned to market the remaining building lots and Kure planned to build a 1,000 foot pier in front of the Breakers to be named the Wilmington Beach Pier. It was begun in December of 1953 and completed in time for the 1954 summer season. That was the pier’s only summer. 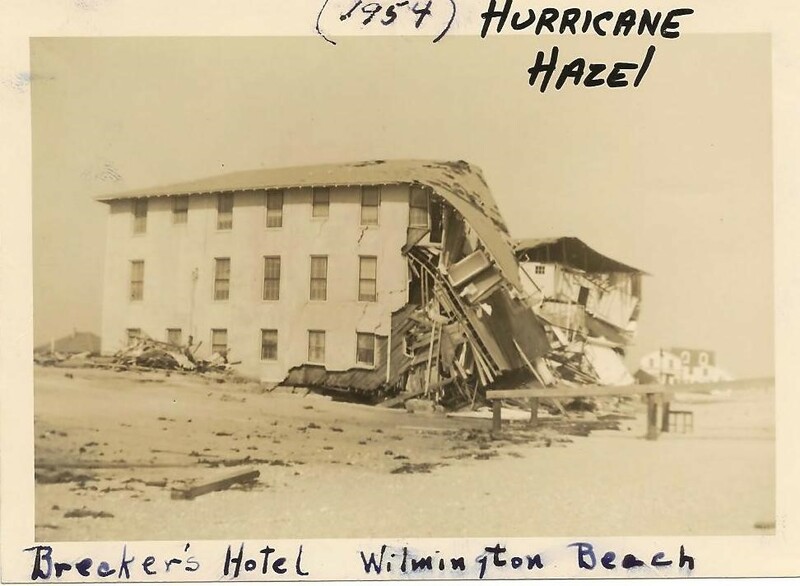 On October 15, 1954, mighty Hurricane Hazel destroyed the pier and most of the hotel. What remained was later torn down bringing an end to the Breakers Hotel. On its footprint today is Sea Colony Condominiums, between the Golden Sands and Pelican Watch. The pier ruins stayed on for many years and was nicknamed “Stub Pier” by locals. 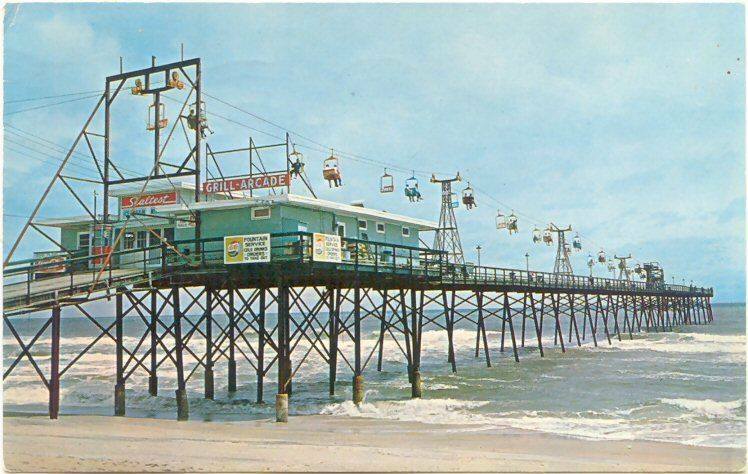 It was just south of Center Pier which also opened that summer of 1954, and suffered damage in the only Category 4 hurricane to hit our area in all of the Twentieth Century to present. If there was ever a pier that described the disclaimer ‘It seemed like a good idea at the time,’ it would be Fisherman’s Steel Pier on Carolina Beach. J.R. Bame and his son J.C. Bame, both Carolina Beach businessmen, were approached with the idea to build a steel pier in 1955. The elder Bame, who already owned a hotel and Center Pier, thought it was a good idea. In Spring of 1955, they began construction on the state’s third steel pier. The price tag was estimated at about $75,000. At the very beginning of construction, Hurricane Connie destroyed half of what had been built, but the pier was operational by 1956. 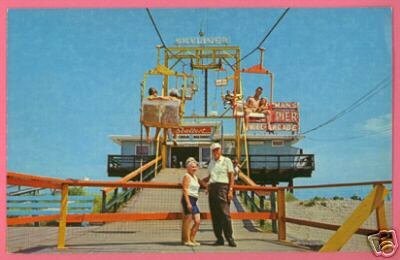 Angler Jack Wood recalls the location of Fisherman’s Steel Pier as ‘downtown at the boardwalk.’ The entrance was behind the bumper cars and north of the putt-putt. That put it right across the street from Carolina Beach’s largest amusement park, Seashore Park.